Yes, it’s universal and will simplify our life — yet, again! — from four remotes to one. Ah, simplicity. [Alluding here to Greg’s hint to me about last year’s remote: “It will simplify your life.”] PLUS, it’s perfect for any die-hard Wildcat fan. ESPN channels can even be programmed into the remote so you don’t have to remember whether it’s 3-0 or 3-2 you want to watch Wall dunk the basketball. Continuing with the technology theme, Greg gave me a DVD player this year. Yeah, I know, romantic. But, really, I [indirectly] asked for it by saying I wish the XBox, which doubles as our DVD player, played burned DVDs so we could watch the “Dexter” episodes we have downloaded on the computer. All of this to say, Greg was especially excited about the UK universal remote because I guess we’ll need two universal remotes to control all the electronics. Um, that sort of complicates simplicity, but, hey, whatever works, right? 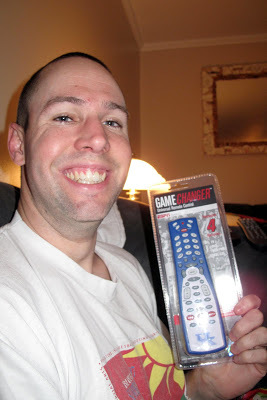 I guess we can quickly flip between Wall’s dunks and Dexter Morgan using just two remotes, and not five.